Computational science is an exciting new field at the intersection of the sciences, computer science, and mathematics because much scientific investigation now involves computing as well as theory and experiment. This textbook provides students with an introduction to the subject. 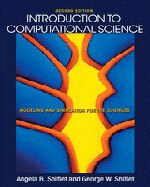 It assumes only a background in high school algebra, enables instructors to follow tailored pathways through the material, and is designed specifically for an introductory course in the computational science and engineering curriculum. The accompanying website offers tutorials and files in software packages, including Maple.